No grandiose statements or placards. No chest-beating. No gaggle of mediapersons or TV cameras trying to devour glimpses of roadside spot clean-ups. Instead, this is what it was: An unprecedented co-ordinated effort by BBMP officials of all rungs and committed volunteers from Yelahanka, North Bangalore, that cleaned up the waste overnight on the last three major festivals—Ganesha, Bakrid and Dasara. They call themselves, Yelahanka Eco Group (YEG). To put it succinctly, it’s the real Swachh Bharat we have all been dreaming of. In letter and spirit. The genesis of YEG is rather fascinating. Many civic groups including Civil Defence Team, Friends of Lakes, Civic Warriors and Namma Vidyaranyapura, some schools and temple authorities and an NGO came together to form this group and took waste management as one of the major responsibilities along with lake rejuvenation and other civic causes. YEG gained in momentum with BBMP Chief Engineer Parameshwaraiah, Medical Health Officer Dr Sandhya, the entire BBMP staff and area contractors evincing keen interest in the group dynamics. Soon, the group held brainstorming sessions and drew an action plan for Ganesha festival. Awareness programmes were held in all schools, temples and communities. Wherever possible, dedicated arrangements were made for safe idol immersion to avoid direct dumping in the lakes. Thanks to plaster of Paris (PoP) idols, this festival renders waste management a lot more miserable for the concerned few. But Friends of Lakes, which works towards lake rejuvenation, went on a hyperdrive with other volunteers and stalled idol immersion in eight lakes of Yelahanka. They allowed immersion in a makeshift kalyani layered with plastic near each lake. They collected all the green waste and composted it on the spot. The volunteers had to grapple with all kinds of people, especially painful were those who dumped their king-size idols which couldn’t fit in the small kalyani somewhere on the wayside and headed home! An awareness campaign is underway at a school on clay Ganeshas and safe immersion methods by YEG members. A small makeshift immersion tank put up near a lake to prevent water pollution. Immersion was allowed only in this tank which was layered with a plastic sheet. All the green waste was segregated near the lakes and composted on the spot. 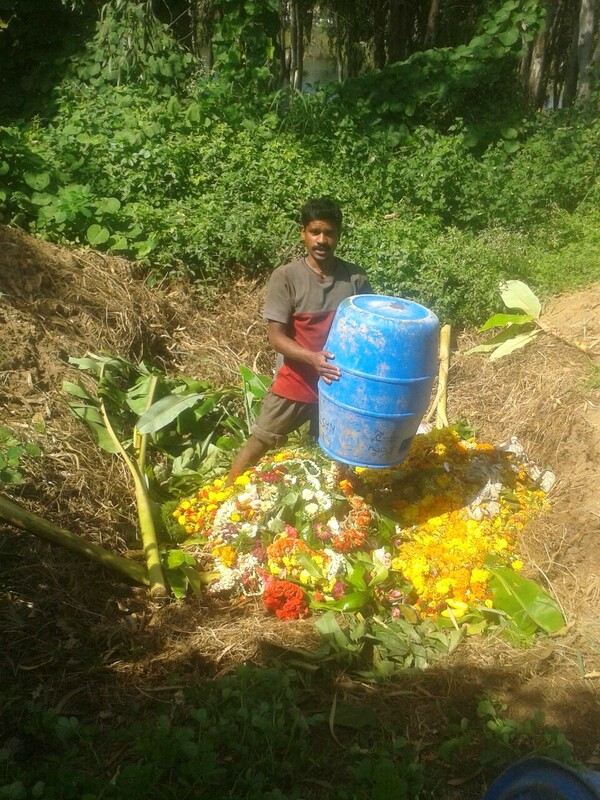 Composting of Ganesha festival near a lake in Yelahanka. It tells us clearly the value of segregated waste. A stellar example was set with the Joint Commissioner leading YEG from the front. It was a swift operation done with utmost care and concern to avoid spilling on the roads. “We intensified awareness programmes in all mosques and meat stalls and stressed segregation. Arrangements were made for safe transportation of the waste within three hours. Temporary arrangements were made for safe disposal of the meat waste at Kogilu Bande in Yelahanka,” adds Rajesh. By now, the team was experienced and hence, the efficiency levels were set to amp up. Whenever necessary, the team resorted to quick course corrections and some more fine-tuning of the WM strategies. Tonnes of biodegradable waste was segregated at the spot, loaded into trucks and sent for composting. Dry waste was sent to collection centres in the locality. All this went on like clockwork even as the JC pulled up corrupt contractors who tried making some fast bucks. The volunteers kept updating the progress on their WhatsApp group. Each area had its own volunteers who worked in tandem with the area BBMP officials and contractors. There were glitches, no doubt. But still, the effect was fabulous. 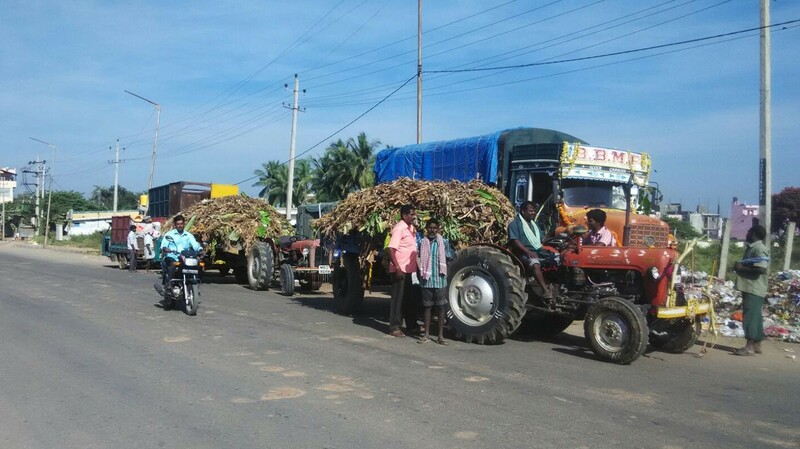 Almost all the roads were free from large banana stems, flower and vegetable waste. Badar Fathima, Principal, Oriental School, offered space in her land for composting. Some team members visited the spot for inspection. Large pits were dug and kept ready before the waste arrived in trucks. Rajesh got the composting going in no time. 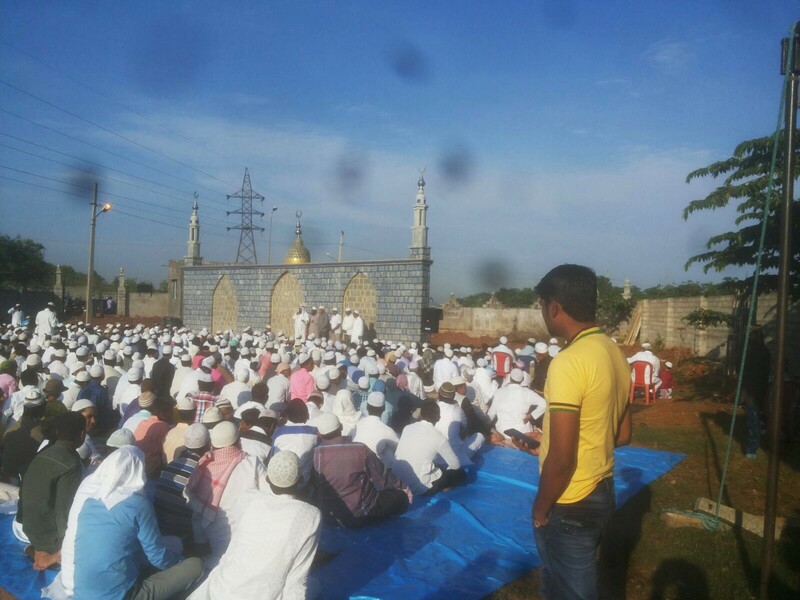 A day after Bakrid, nearly 80 tonnes of meat waste was composted. 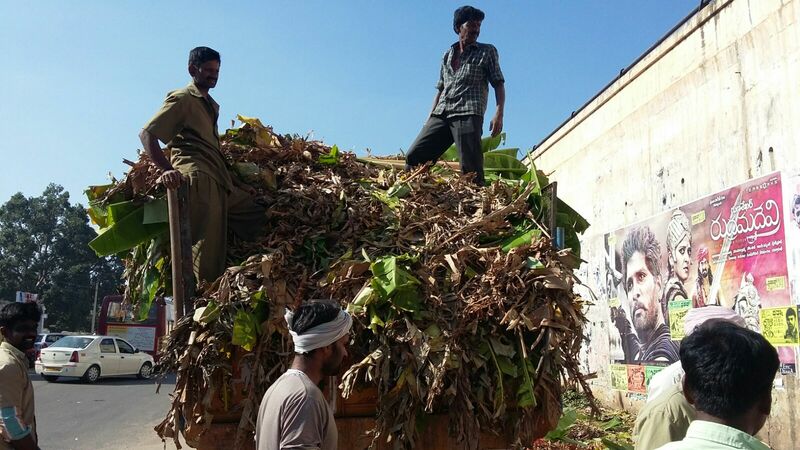 Similarly, nearly 60 tonnes of green waste went into the pits just a day after Dasara. In all, approximately, 140 tonnes of waste was composted by YEG members with Rajesh managing the operations at the site. BBMP Medical Health Officer Dr Sandhya overseeing composting operations. 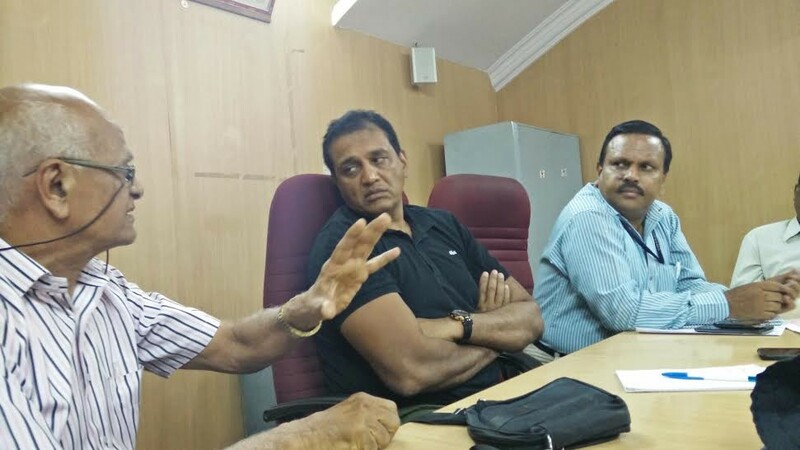 N S Ramakanth, JC Sarfaraz Khan and Chief Engineer Parameshwaraiah at a meeting held on October 30 to discuss WM strategies for Deepavali festival. “Many areas in the city are still struggling with the Dasara waste and here we are, discussing waste management strategies for Deepavali already,” said a visually jubilant JC at a meeting held on October 30 in Byatarayanapura BBMP office. This time the agenda was to discuss how best to replicate YEG’s own achievement for Deepavali. That includes, of course, containing air pollution by educating schoolchildren and communities on the hazards of firecrackers. 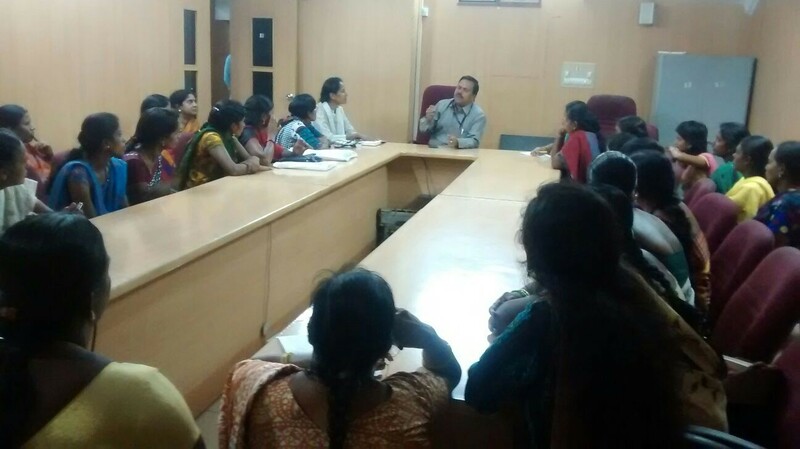 Chief Engineer talks to linkworkers on the importance of segregation during Deepavali at a meeting held on November 2. Most often we think teamwork happens through communication. But voluntary work of this nature where the waste thrown out by someone else needs to be directed to a proper destination needs not just communication, but communion of the highest order. YEG is evolving with critical exchange of ideas, broad reflection and decisive action. Each individual member is pooling in one’s own strengths and ideas which are collectively reaching a dynamic consensus. But it isn’t just that. It is about how, when bound by sincerity of purpose, all religions can come together to achieve a common goal. Waste knows no religion. It’s apolitical. But historically, we have seen how waste assumes an identity of its own depending on who throws it and who deals with it eventually. Thankfully, that conflict is absent here. That’s why no matter where it originates from, waste of all streams is reaching a holistic destination. If this is not a beautiful communion, what is? This entry was posted in Endlessly Green and tagged Bakrid meat waste managment, BBMP Joint Commissioner Sarfaraz Khan, Dasara waste management, Deepavali/Diwali waste management, festival & waste, Friends of Lakes, pit composting, safe Ganesha idol immersion, waste management in Yelahanka BBMP, Yelahanka Eco Group. Bookmark the permalink.